Nearly 50 people die each day in road accidents during Thailand’s two most popular festivals. On March 24 a bus accident in Tak province in western Thailand killed more than 30 people. The chartered double-decker bus was carrying municipal workers on a field trip. A month earlier, 15 school bus passengers died after their vehicle collided with an 18-wheeler truck in Prachinburi province. More than 40 people were seriously injured in the accident. The crash took place on a mountainous slope that is regarded by the Department of Highways as the most dangerous highway section in the country. Since 2007, more than 100 people have been killed and 500 injured by road accidents in that particular area. On December 27, at least 29 tourists died after their bus plunged into a deep gorge in Petchabun province. Road accidents in Thailand shoot up during the two most popular holidays in the country: New Year and Songkran Festival (April). More than 600 people are killed on Thailand’s highways during these two festivities or an average mortality rate of 49 person per day. Because of the high rate of accidents during this period, the police are calling it the “Seven Dangerous Days” of the New Year. But despite the government’s information push on road safety and responsible driving, a high number of road mishaps were still registered last December and January. According to the Road Safety Center, 366 people were killed and 3,345 injured in 3,174 road accidents during the danger period. Another such period will take place next week during the Songkran festival. Road safety has been a major issue in Thailand for many years. Despite its large number of tourist arrivals, Thailand seems unable to improve its road safety record. In fact, several foreign embassies have already advised their citizens about the dangers of land travel in Thailand. The statistics confirm this bad reputation. According to the World Health Organization, Thailand registered the highest record for fatal road accidents in Southeast Asia. About 38 out of 100,000 people die from road accidents in Thailand annually compared to the global average of 18. Bus accidents may have figured prominently in the past few months, but statistically-speaking, it’s more dangerous to ride motorbikes in Thailand. More than 11,000 motorbike drivers or passengers die from road accidents annually, representing 70 percent of the country’s road fatalities. Aside from legislation and proper implementation of traffic laws, the WHO recommends the adoption of crash avoidance technologies. For example, Thailand can strengthen its road traffic injury data systems. Immediately after the fatal bus crash last week, the Land Transport Department ordered all double-decker bus drivers to undergo retraining and apply for a new license. It also announced that provincial buses are now required to install safety features such as an anti-lock braking system. The department also wants to limit the height of double-decker buses to four meters. The deadly road accidents in recent months have forced the government to review its road safety policies. Prime Minister Yingluck Shinawatra has vowed to improve road infrastructure especially in the affected provinces. Public awareness campaigns should also target the young. For Weerawit Wajjanapukka, chief of the Traffic Police Division in Bangkok, strict enforcement of traffic rules would be meaningless if drivers continue to be irresponsible on the road. “It seems most drivers only display road etiquette to pass their driving test. It’s very important that everyone puts those values and correct practices into practice. Strict law enforcement alone can only fix the tip of the problem; we need contributions from every driver,” he said. Thailand has grabbed global headlines in the past six months because of the street rallies in Bangkok; in particular the clashes between the police and anti-government protesters. Without belittling the number of casualties caused by this political conflict, it must be emphasized that more people have died riding buses in Thailand than joining protests in the capital. 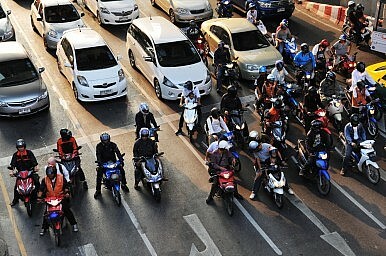 There should be an aggressive and continuous initiative to make roads safer in Thailand.